Xiao Chua’s Xiao time made a special report of how did the Martial law stopped showing several violent cartoons on TV. 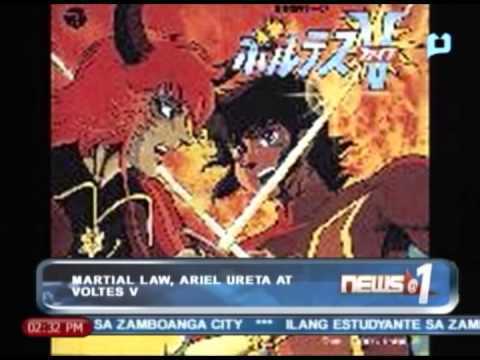 One particular cartoon that we remember is Voltes V, which is very popular with kids during the 1980’s. A certain Catholic personality was not happy with violent scenes so she calls out the president to stop the cartoon series. The president was persuaded so kids were devastated when they found out that their favourite cartoon has been cancelled. The report also clarifies what really happens to the controversial incident wherein famous celebrity Ariel Ureta reportedly punished by biking around camp crame. When Ariel Ureta was interviewed, he denied that he was punished by commenting some jokes about the government, but he suspects that the government spread the rumours to warn others about commenting bad about the government. He said that it never happened and it was just an urban legend.